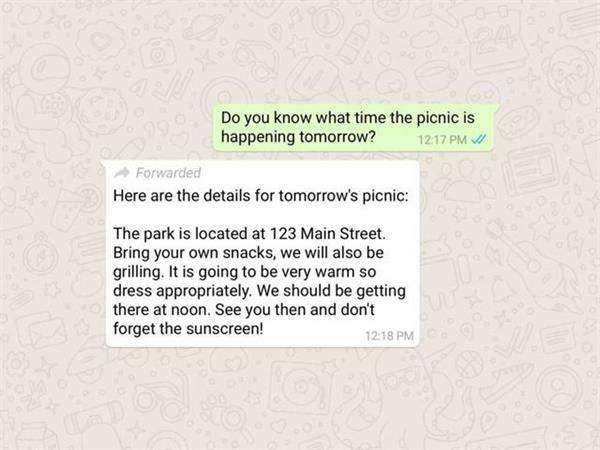 WhatsApp on Tuesday night launched a label to identify forwarded messages in order to combat fake news and the spread of misinformation. “Starting today, WhatsApp will indicate which messages you receive have been forwarded to you. This extra context will help make one-on-one and group chats easier to follow. It also helps you determine if your friend or relative wrote the message they sent or if it originally came from someone else,” the company gave a statement. “This morning we started an education campaign in India on how to spot fake news and rumors. Our first step is placing newspaper advertisements across the country in English, Hindi, and several other languages. We will build on these efforts going forward,” said a WhatsApp spokesperson. WhatsApp said it cares deeply about its users' safety. “We encourage you to think before sharing messages that were forwarded. As a reminder, you can report spam or block a contact in one tap and can always reach out to WhatsApp directly for help,” the company added. “It’s important for people to know if a message they’ve received has been forwarded or not. Without this context, it’s not clear whether a message is new or a potential rumor shared by others. The extra information can help people decide if they should take action on the information they have received,” the spokesperson said. Lawyer Apar Gupta said Whatsapp’s feature for flagging forwarded messages will at best indicate that the message has been idly sent through the forward function. “It has easy circumvention. One may be able to copy, paste it, then send it, hence avoiding the labeling. A single character change such as changing the capitalization may defeat other protection measures as well”. Sunil Abraham, co-founder at think tank Centre for Internet and Society welcomed the move. “This is an excellent start. It will definitely help users raise levels of skepticism when reading a forwarded message. I hope WhatsApp will also add a “fact check this” button next to the forwarded message,” he said.